Crowns (metal cap over teeth) and tooth color restorations (fillings) are used to seal and protect damaged teeth. These procedures are also referred to as Restorative Dentistry. Dogs chew on hard objects (bones, antlers, cages, rocks) that will weaken and fracture teeth. Dental composites (tooth colored fillings) are used to recreate the lost tooth structure due to fractures or cavities, effectively sealing the tooth and retaining the tooth. Crown therapy is offered to pets and working dogs for teeth that have become damaged (abrasive wear) or after root canal therapy. We use titanium alloy crowns to protect these teeth. 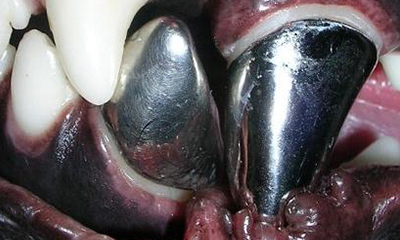 Titanium crown protecting the fractured lower canine tooth. The two most common indications for crown therapy in dogs is to protect teeth after root canal therapy and patients with separation anxiety that bite on their cage/enclosure. 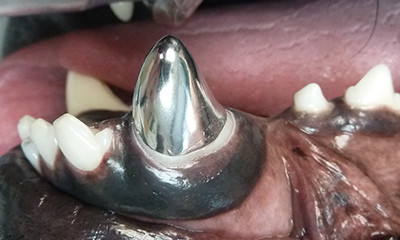 In veterinary dentistry, we use titanium alloy crowns for their strength and bio-compatibility. 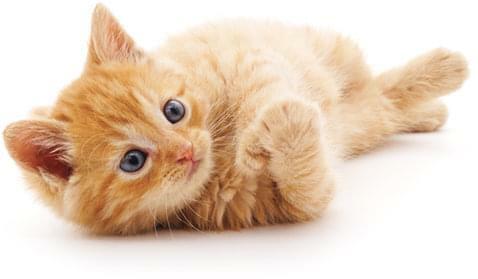 Pet-owners sometimes request “tooth colored” crowns. However, zirconium or ceramic crowns are prone to fractures based on the high bite forces dogs exert.